The Apollo 14 Moon Tree Run commemorates one of the six moon landings made during the Apollo missions of the late 1960s and early 1970s. The pilot of the Apollo 14 command module was Stuart Roosa who worked as a fire fighter at the Siskiyou Smokejumper Base. He carried tree seeds to the moon in the lunar module. When the astronauts returned to earth the seeds were planted and the trees that grew from them became known as moon trees. It is fitting that the starting line for the Moon Tree Run is located at the place where the moon tree story began. 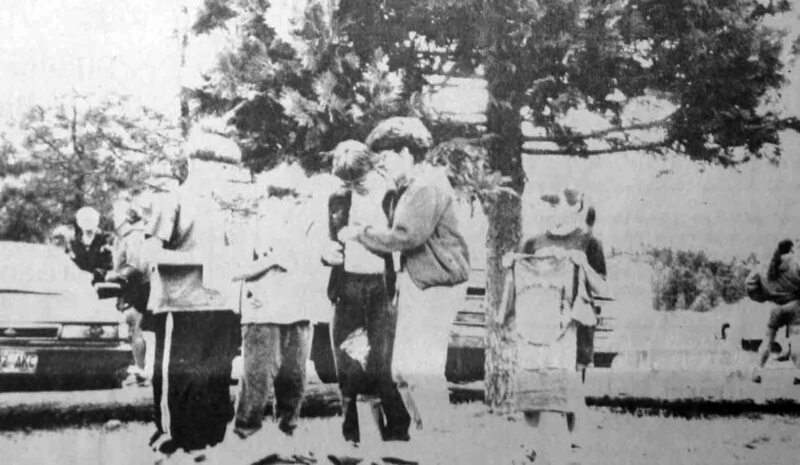 Roosa returned to the historic base in 1976 and planted one of the trees. 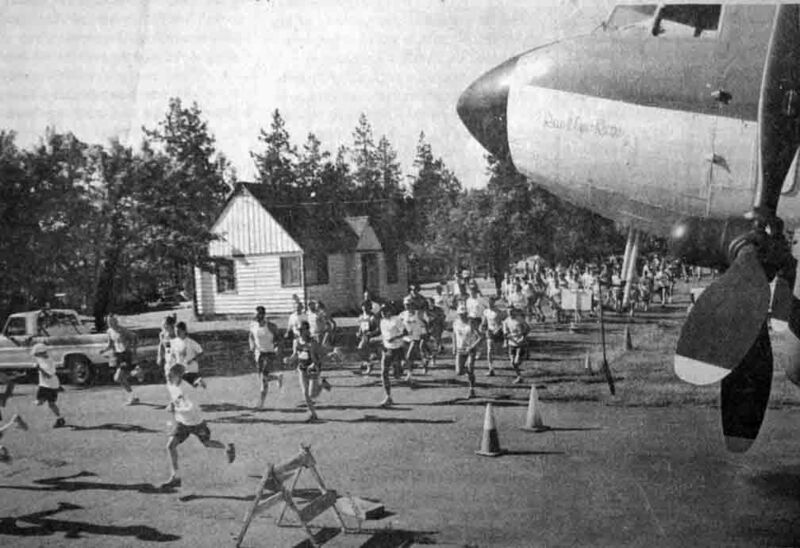 The first Moon Tree Run was organized in 1979 by Dale O’Keefe’s, postmaster in O’Brien, Oregon who enjoyed running and decided the valley needed a cross-country event of its own. 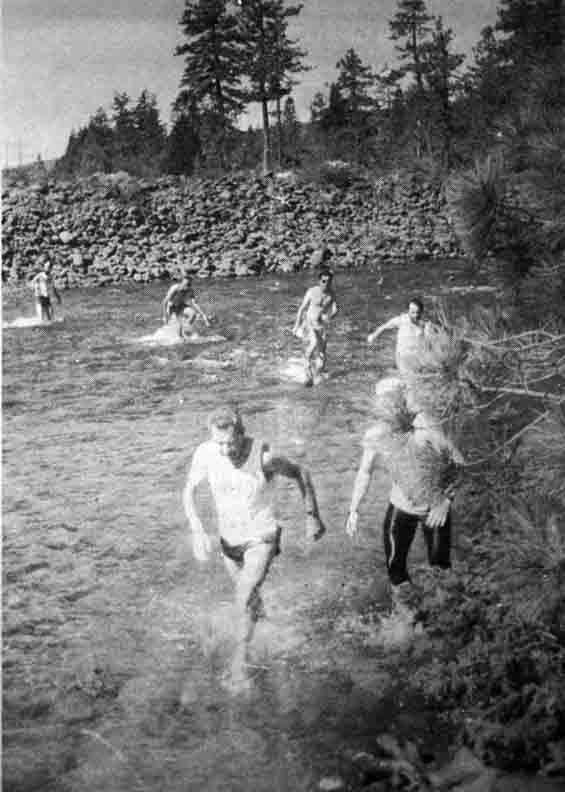 At this time the Siskiyou Smokejumper Base was still in operation and it was decided that the course should follow route used by smokejumpers for their physical training. 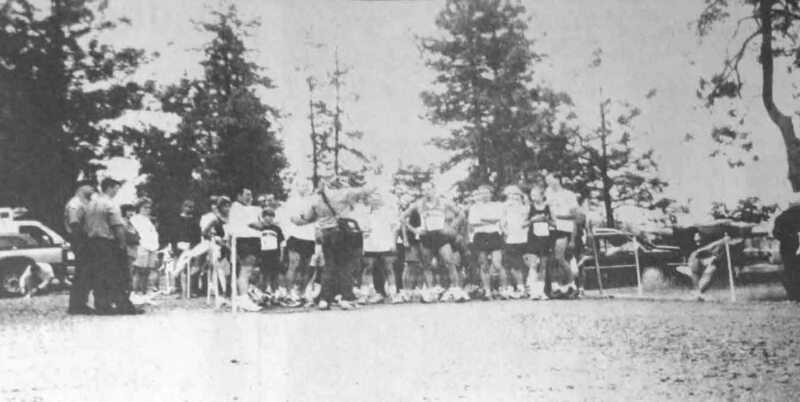 The first run was held on June 3, 1979 with over 180 runners participating. Neil Branson took overall first place in the premiere run, with George Weinzetl taking the top spot on the 60+ bracket and Nancy Reynolds in the 14-18 category. 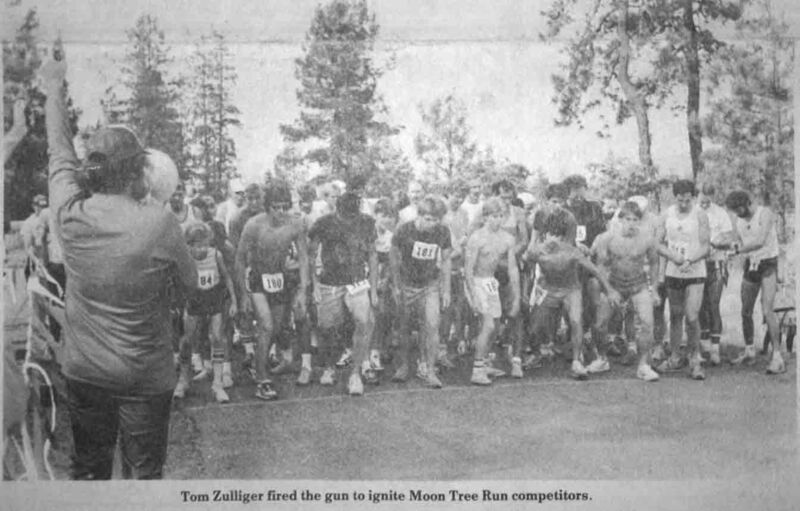 From that time on, the Moon Tree Run became a local tradition for the next 20 years. 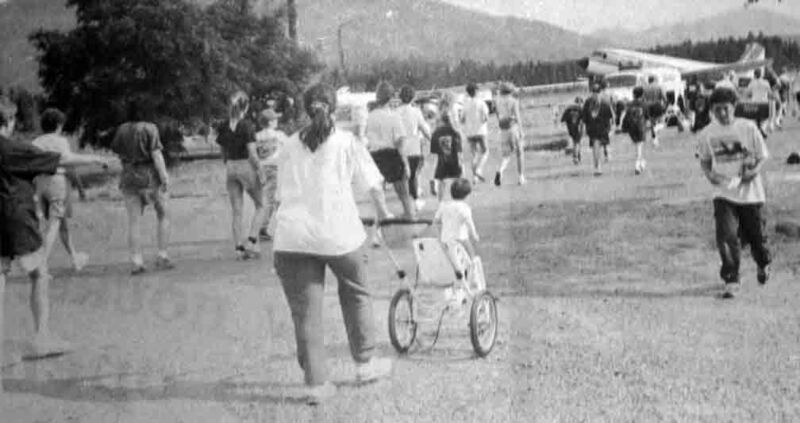 The first eleven years of the Moon Tree Run, 1979-1990, was sponsored by Illinois Valley Chamber of Commerce, with the Illinois Valley Volunteer Firefighters Association sponsoring the event from 1991-1997, and the Illinois Valley Family Coalition sponsoring the event for its last two years, 1998-1999. 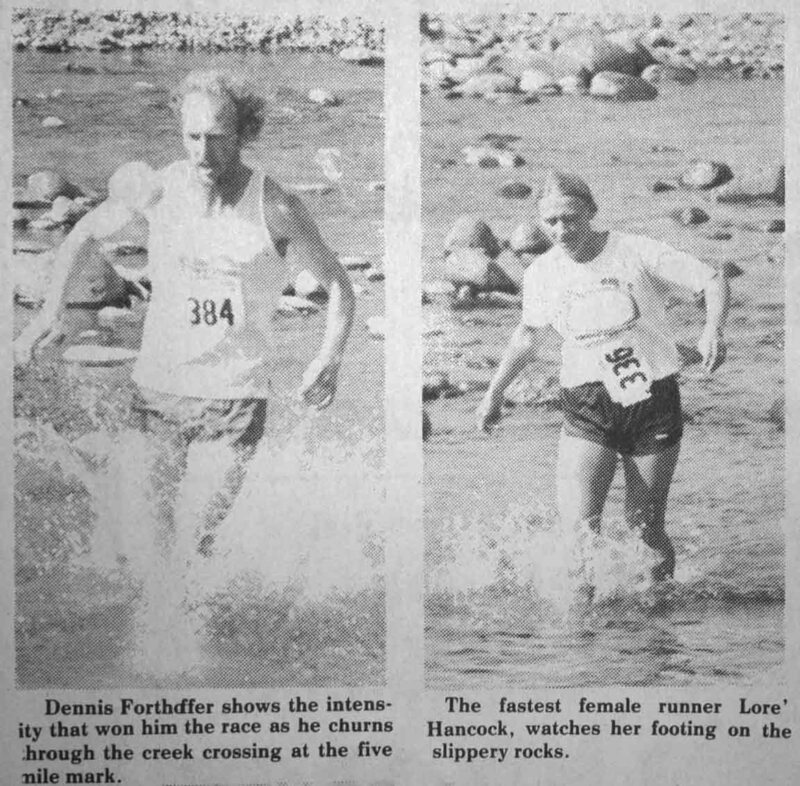 Dale O’Keefe was the race director from 1979-1981, followed by Chuck Messenger, who shared the job with Tom Zulliger. The last years of the event was organized by Zulliger. 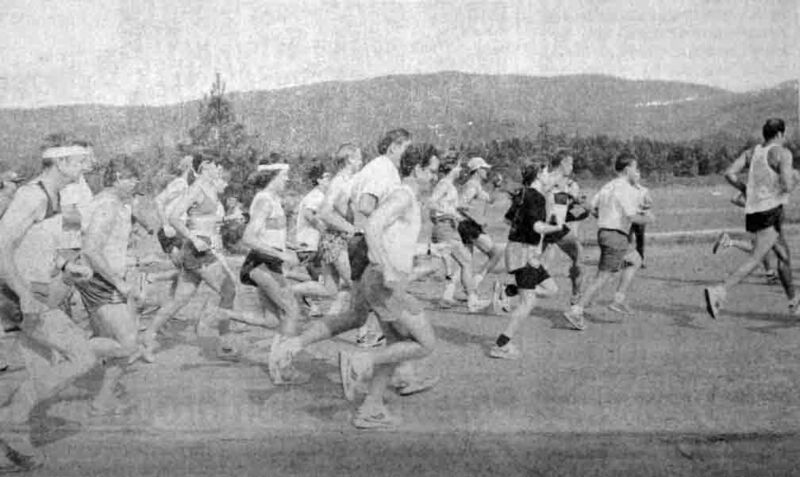 The largest number of participants to sign up for the event was during the June 6, 1981 Moon Tree Run with a turnout of over 400 people. The event has had contestants ranging in age from three years to eighty one. 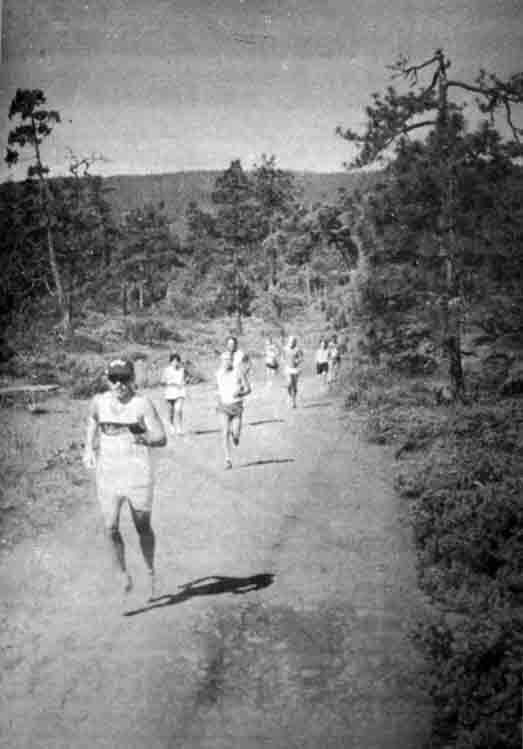 The course record for men, set in 1982 by Bill Yeoman, still stands at 34:09. 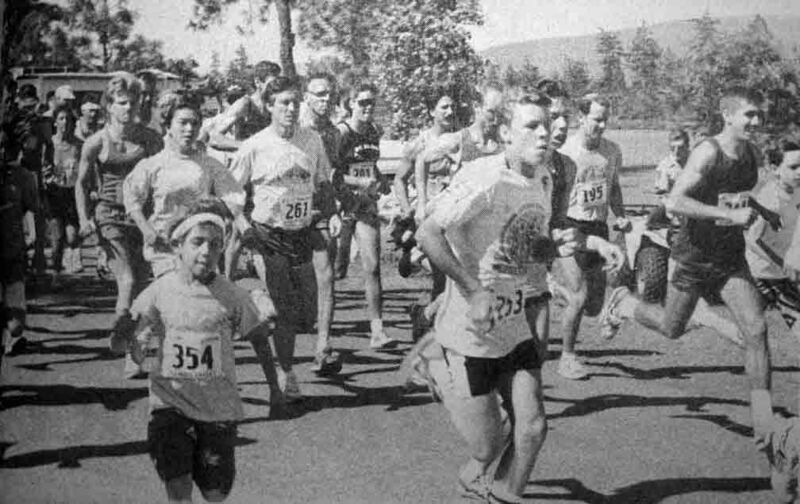 Sidney Morrison-Cataldo set the women’s record of 41:22 in 1988. 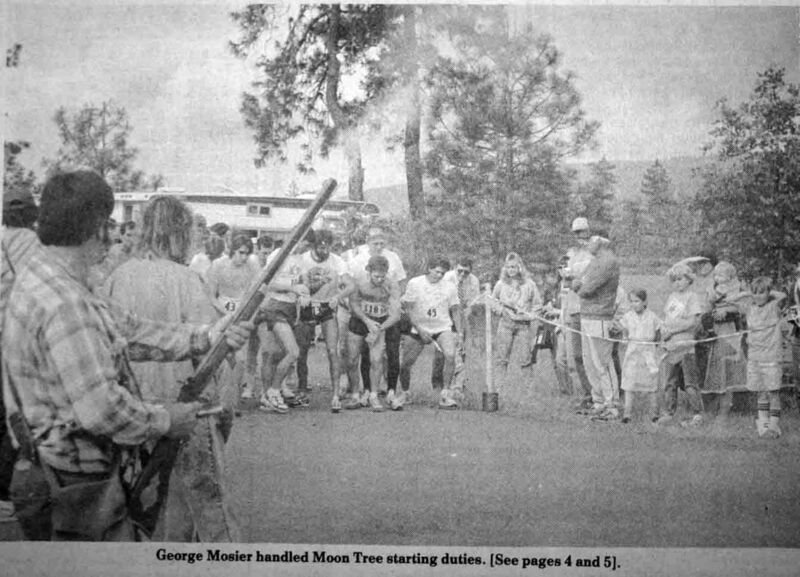 The Moon Tree Run has always been a “small town” event and has had its share of humorous moments and interesting characters. Here are a couple of stories that were recorded in the local paper. 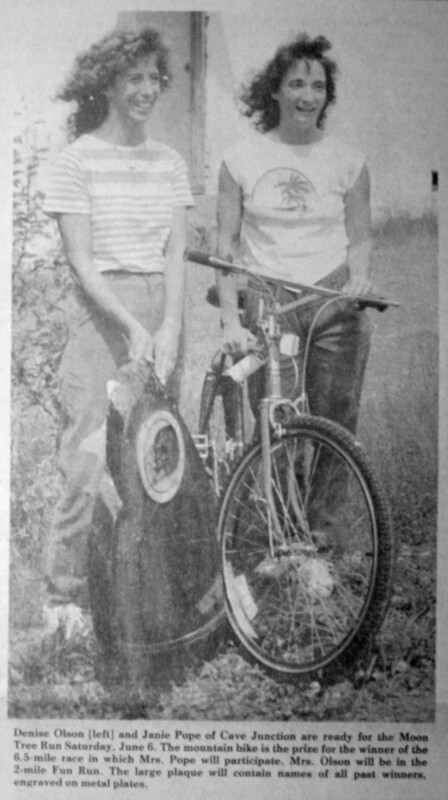 In 1979 when Edith Cronk crossed the finish line, she received two t-shirts, a large one for herself and a small one for the little one that crossed the finish line in front of her; she was six months pregnant. In 1980, event organizers found an opportunity for humor when Frank Taus inadvertently enclosed a shopping list with his entry form. 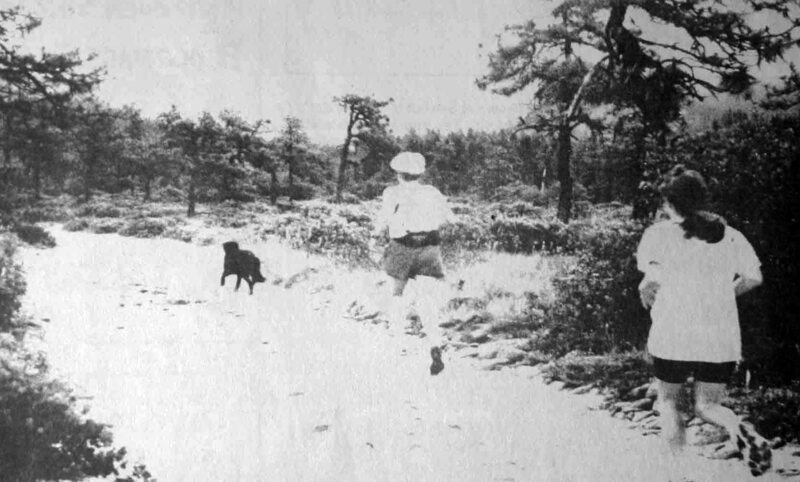 When he completed the run, he was handed a grocery bag containing a can of dog food, a quart of milk and some hamburger-just what was on his list. 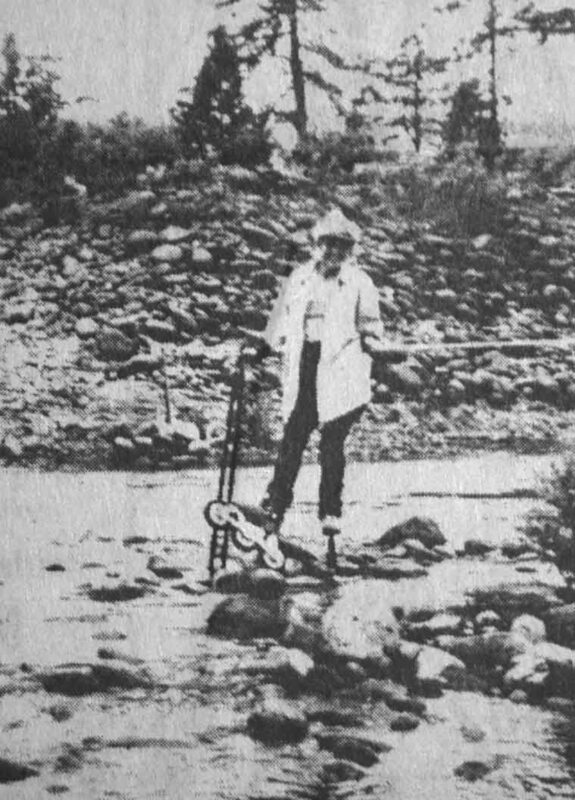 In 1999, Lorna Warnes completed the whole race course on rollerblades, even while crossing Rough and Ready Creek. This was done as part of her efforts to promote in-line skating in the local community. 1999, Illinois Valley News. 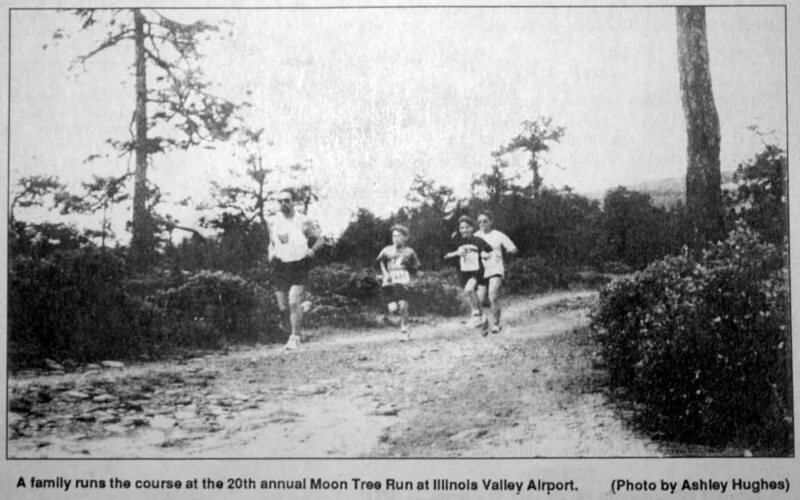 Moon Tree Run set in June at airport. Illinois Valley News, May 26, 1999.